Constantinople is like an onion. The outer skin that you see first can seem a bit brown and wrinkled. Pollution and the crush of immigrants from the hinterland in search of a better living have put unbearable strains on the city in recent years. But anybody curious enough to look at the surfaces beneath the skin is sure of an extraordinarily rich experience. Each layer of the Istanbul onion can be thought of as a different historical period, building on a series of layers that takes us back into the mists of time. There has been a significant settlement for at least thirty centuries on the spot where now stands the magnificent Topkapı Palace. Surprisingly, however, the great pre-Christian cultural flowering in Greece and Persia largely sailed past Istanbul (or Byzantium as it was then called after Byzas, a ruler of the seventh century BC). Byzantium was a wealthy city from trading and shipping. But it was not until the Roman Emperor Constantine chose it as his capital in AD324 that the city, located at one of the most extraordinary strategic crossroads that the earth has provided, really came into its own. In AD326 Constantine traced out the limits of his new capital. Mighty defence walls were built in an arc from the Sea of Marmara to the Golden Horn, the inlet of water surrounded for centuries by peaceful gardens but which now divides the old part of Istanbul in two. Before long the city had become popularly known as Constantinople, the city of Constantine. At the time, the size of the city envisaged by the emperor was considered to be preposterously large. But within decades it was already too small to take the crowds who were flocking to the commercial and political opportunities at the new centre of the Roman Empire. The unemployed arrivals were well-fed by state handouts of the produce of the Nile valley-produce that for centuries filled Byzantine stomachs. (The modern Turkish word for Egypt is Mısır, which also means corn.) These layabouts soon found they had little to do but idly plot and intrigue in a thoroughly Byzantine way about how to overthrow an emperor or two. The focal points of the city were the Hippodrome and the Grand Palace. The Hippodrome was a vast amphitheatre that could seat 100,000 and which hosted chariot races and all sorts of popular gatherings. Today there is a small corner of the amphitheatre still standing near the Blue Mosque. The Grand Palace stretched in a shamble of halls and chambers from the Hippodrome down to the sea. Little of the palace is left except for a mosaic discovered in 1933. It is now the centre-piece of the Mosaic Museum. For the next ten centuries the Christian empire of Byzantium fought off invader after invader. The Persians came and went so did the Bulgars, the Venetians and the Arabs. But the city had its ups and downs, and it was only a matter of time before some invader or other would take it for its great strategic significance. That task fell to a group of Muslim Turks called the Ottomans, or Osmanlis after their first leader Osman. In the space of 150 years, they had conquered most of western Anatolia and the Balkans, establishing capitals first in Bursa and then in Edirne (Adrianople), progressively weakening the remnants of the Byzantine Empire. 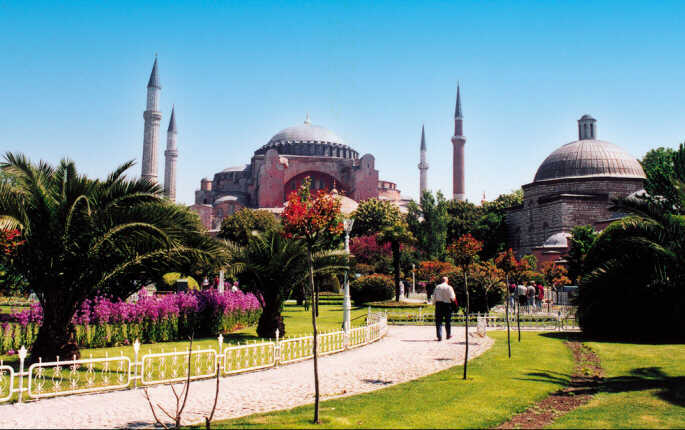 Sultan Mehmet saw an opportunity to lay siege to the city, taking it in 1453 and changing its religious centre-piece, the church of Haghia Sophia, into a mosque. The Christian capital of the Eastern Roman Empire became the Muslim capital of a nation that was to create one of the most splendid empires on earth. After 1453 the Ottomans expanded their empire west and south until it reached its apogee in the middle of the l6th century under its most famous sultan, Suleyman the Magnificent. At that time, when Henry VIII was ruling in England and Francis I in France, the Ottomans' state was the most powerful in the world. There is much more to be seen today of this empire than there is of its predecessor. Suleyman's chief architect was the great Sinan whose masterpiece is the Suleymaniye mosque in Beyazit just behind the university. There are over eighty Sinan buildings still standing in Constantınople. The home of the Ottoman rulers for almost 400 years was the Topkapı Palace where they framed government policy and where their entourage of eunuchs, wives, concubines and viziers plotted and schemed in sybaritic splendour. But the empire began to shrink almost from the moment that Suleyman died in 1566. In 1600 it stretched from the gates of Vienna to Baghdad and then around the southern coast of the Mediterranean as far as modern-day Algeria. By the l9th century these boundaries had been nibbled away and the nation had fallen so far behind European economic and social standards that it was known as the Sick Old Man of Europe. It then set out on a series of reforms modelled on western European lines, and western influences began to infiltrate for almost the first time. The strongest influence was French-partly because of Aimee de Rivery, the cousin of Napoleon's Josephine. She became the wife of Sultan Abdulhamid I and gathered French artists and architects around her. The heart of Constantinople moved to Pera on the other side of the Golden Horn from Topkapı. Streets there had names like Rue de Venise, and society met at the Cafe de Luxembourg. 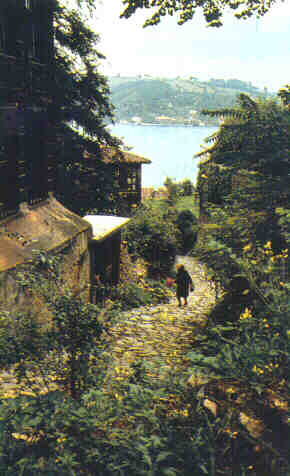 Along the shores of the Bosphorus magnificent wooden houses were built as homes for those close to the imperial court. After the Russian revolution a clutch of Russian princes joined the exotic Istanbul mix of Levantines, Armenians, Jews, Greeks and Ottomans. Dishes like strogonoff are still popular in some restaurants. The First World War marked the end of the Ottoman era, for the Ottomans had sided with the Germans, and by 1919 almost all their lands were occupied by the victorious forces. Out of the chaos of that time emerged a military leader called Mustafa Kemal. He rallied the Turks of Anatolia and threw out the occupying forces. He then set about creating á modern secular republic on the rectangle of land that is Turkey today, a rectangle that is about the size of France and the United Kingdom put together.